A Package From Ally + NEW Blog Header! You know how I was on that surprise Disney trip? Yeah? Well, when I got home at 1:07 am, my mom told me I had a package and brought it into my room. I knew what it was the second I saw it, and you know, the return address: Carter, Tulsa, OK. Remember my Catch Up post where there was a picture/short article on Ally’s Email ? 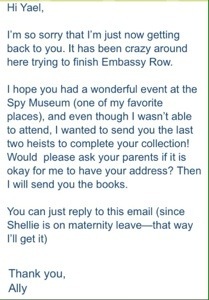 If not, go read it now, but Ally Carter (my favorite author) wrote to me saying that she was sorry she’d missed my Bat Mitzvah and was going to send me the rest of her books signed to complete my collection! Fangirl moment. You guessed it, the package was the books. I opened it, and there they were, so very perfect, and right on the title page: “Yael, Have a great heist! Ally Carter” (pictured below) I also found a pair of sunglasses just like Kat’s (the main character of the books) with Heist Society on the back, & it was so nice of her to send them to me. Thank you again, Ally, for making my week. Yep, that’s right. We have an OFFICIAL blog header now thanks to Kirsty of My Clockwork Castle and Just Sunshine & Blue Skies! This lovely girl created my header for me after we’d corresponded for awhile, and after I took forever to make a draft for her. My draft (below) is pretty messy compared to Kirsty’s (below). Yes, we used different applications to create these, but still. I hope you like the new blog header as much as I do! Super cool blog heading!! I love it!! You can tell she had great inspiration from your draft….